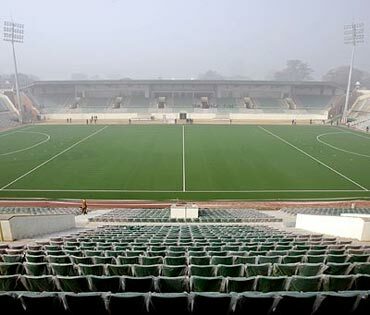 Rediff.com » Business » Govt to lease out C'Wealth Games stadia! 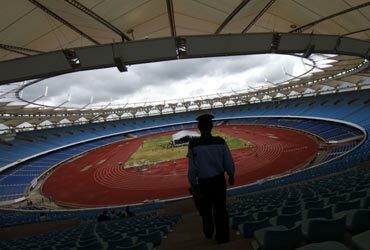 Govt to lease out C'Wealth Games stadia! In a major public-private partnership effort in sports infrastructure, the Centre has finalised a plan to offer five major sports complexes built for the Commonwealth Games on a 10-year agreement to companies after the games are over. Companies will need a minimum of Rs 1,000 crore (Rs 10 billion) as their net worth to bid for the two big stadia -- JN Stadium and Indira Gandhi Sports Complex. For the remaining three -- Major Dhyan Chand National Stadium, Dr Syama Prasad Mookerjee Swimming Pool Complex and Dr Karni Singh Shooting Range -- the net worth for bidding would be Rs 500 crore (Rs 5 billion). The Ministry of Youth Affairs and Sports has asked Feedback Ventures to advise it on the bidding process and has floated a request for qualification (RFQ) from interested companies, which will close on August 23. 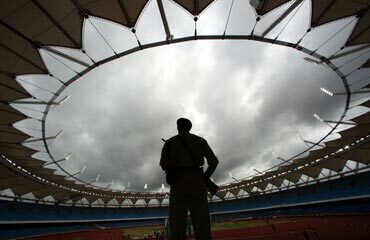 Image: A paramilitary soldier stands guard inside the Jawaharlal Nehru Stadium constructed for the 2010 Commonwealth in New Delhi. The ministry, along with Sports Authority of India (SAI), held a meeting today under the aegis of the Federation of Indian Chambers of Commerce and Industry with companies to discuss details. Representatives from Reliance IMG, Wipro, Coca-Cola, GTL Teleservices, AISA, Australian Trade Commission, 21st Century Media and Golf Academy were among those who attended the meeting. Sources said several of these companies have shown interest in the bidding process. Under the terms for bidding, the company which offers the highest annual fee and wins the bid will be allowed branding rights over the stadia, permission to sub-let built up space, use the venue for concerts and sports-related activities and running academies, among other things. They will also have rights for ticket sales and parking in the area. Even sponsorship rights on events organised by sports federations will be given to them as part of the deal. Image: A security officer at the Jawaharlal Nehru Stadium constructed for the 2010 Commonwealth Games. In return, it has to maintain, operate and manage the stadia and ensure a certain number of days are reserved for sports federations which want to use the premises for events, at subsidised rates. The private party will not be allowed to lease the premises out for religious events, political rallies or anything that jeapardises security of the country. It will also not be allowed to bring any structural change to the stadia. Gopal Krishna, secretary, SAI, told Business Standard, "We had an interactive session with the stakeholders to understand issues related to the concept. We intended to seek their suggestions to improve the plan and process in this regard. We are holding another round of meetings with the industry and stakeholders in Mumbai on 30th July." Image: The Jawaharlal Nehru Stadium constructed for the 2010 Commonwealth Games. The government has spent Rs 2,400 crore (Rs 24 billion) so far on renovating and refurbishing these stadiums for the Games. 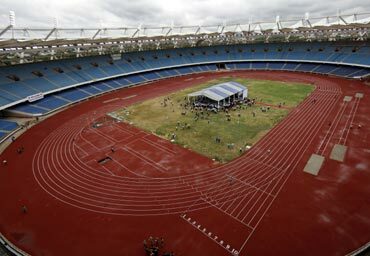 Concerns have been raised that once the event is over, this large infrastructure might be left in disuse and, as was seen after the Asian Games in 1982 in Delhi, deteriorate due to lack of maintenance. The move is expected to get the government a steady stream of revenue, which could be used for promoting sports as well as ensuring that the world-class infrastructure is maintained. It would also give opportunities to sport management companies, in collaboration with corporate groups, to develop new sports properties, as had happened with the Indian Premier League in cricket. Image: Dhyan Chand National Hockey Stadium in New Delhi.